The Southern Illinois University Edwardsville School of Education, Health and Human Behavior (SEHHB) is celebrating the continued professional achievements and proven leadership abilities of four alumni. 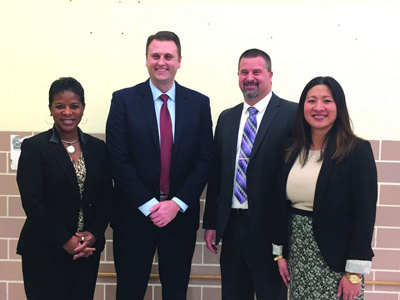 Edwardsville Community Unit District 7 Superintendent Dr. Lynda Andre has announced changes in leadership positions, including transitions to assistant principal and principal positions which involve SIUE alumni Dr. Tanya Patton, Andrew Gipson, Dr. Vince Schlueter and Julie Matarelli. Patton was named principal of Cassens Elementary School. She previously served as principal at Nelson Elementary School since 2005. Patton earned a master’s in education administration in 2003, an education specialist degree in 2011 and a doctorate in educational leadership in 2014, all from SIUE. Gipson, who earned a bachelor’s in music/music education from the SIUE College of Arts and Sciences in 2004, was named principal of Nelson Elementary School to replace Patton. Schlueter was appointed assistant principal at Edwardsville High School. He has earned multiple degrees from SIUE including a bachelor’s in math studies in 1989, a master’s in education administration in 2005, an education specialist degree in 2014, and a doctorate in educational leadership in 2016. Matarelli earned a master’s in education administration from SIUE in 2007. She was named principal at Columbus Elementary School.